This article contains information for potential or existing hen-owners about all the questions you will have as you get started in your chicken keeping journey. Questions like: How long does a hen live? How soon will my chicken lay eggs? When will my chick get feathers? Why on earth you should raise your own chickens....And more FAQs! I remember several years ago, before we actually had our chickens, how I longed to be able to walk out to the yard and gather fresh eggs for us to eat. I had romantic visions of walking through a lovely pastured area to the hen house, where I would gather those clean, beautiful eggs, pet my chickens, and never deal with a problem. Things are a bit different than I imagined (POOP, people! ), but I LOVE keeping my hens. They are a natural anti-depressant. If I'm feeling down, all I need to do is go spend some time with my girls. But what was the final straw that pushed us into getting our chickens? Along with this, find out all the answers to your common chicken questions. All the extra questions you will have as you get started in your chicken keeping journey about the life cycle of a hen. Questions like: How long does a hen live? How soon will my chicken lay eggs? When will my chick get feathers? Why isn't my hen laying as much? How long does a chick need heat? Harvesting is addressed too. Answer all your questions about a hen's life cycle, start to finish. The final straw in our decision to start raising chickens was watching food documentaries like Food, Inc. and educating ourselves about our modern food culture in this country. You can find out more in this short article, DON’T Eat THAT Meat! One of the powerful books we read was Joel Salatin's book, The Marvelous Pigness of Pigs: Respecting and Caring for All God's Creation, in which he openly discusses and shares his opinions and information about important and little known issues with our modern food industry. Plus, Joel Salatin has a great sense of humor, making The Pigness of Pigs an entertaining, if somewhat disturbing, yet thoughtful, read. After researching how our modern food industry treats chickens (inhumanely), it became even more important to us that we not support large agricultural chicken farms. We have not purchased eggs from the market since 2013, and I will never do so again! Uh. Oh.... I'm feeling a rant coming on! And...what do you think happens to them if their egg production slows down a bit? Many of these hens never see the light of day---sunlight. This is a short list. There's more, if you are interested in finding out more about where your store-bought eggs come from. Are these the eggs you want to eat and feed your family? From chickens who are mistreated, living in completely unnatural and painful environments, fed unnatural feed, and are only seen as a tool or machine rather than a creature God created to live a totally different life? This article is really all about the life cycle of a hen and what you can expect when you start raising your own chickens. The natural life cycle that is. Get the Newsletter & Free eBooks! As we started raising our own hens a few years ago, these questions were the ones I was asking: How long does a chicken live? How long will a hen lay eggs? How soon will a hen lay eggs? And so on. I wanted to know EVERY thing about chickens! So, here is a quick outline of a hen's life cycle that will answer your related chicken questions. How long will a chick need heat? and How long until it gets its feathers? Once the chick emerges from the egg, he/she is covered in a fine, soft down. These are not the real feathers, and the chicks must be kept warm, either through the hen's (mom's) body heat or artificially, via a heat lamp until the chick is at least partially feathered. This time period lasts from three to six weeks, depending on the temperature. If the area is below 75*, the chick will need heat until it is fully feathered, at around six weeks. **You might also be interested in reading "Bringing Home Chicks for the First Time: What You Need to Know." Chicks with Mama. You can see the fuzzy covering on the chicks? This is the down, and it is SO soft. The little wing feathers are starting to emerge first. A hen under a year and older than about six weeks is called a pullet. This is the "young child to teen-age" stage of a hen's life. The hen will continue to grow during this time until it reaches it's full size. Egg laying begins from about four months to up to six months, depending on the breed. The eggs will be much smaller when a hen starts laying compared to how large they will become as she matures into a full-grown hen. These first eggs are the cutest little eggs! Some won't have egg-yolks, but don't worry if this happens. It's a normal part of their development. The number of eggs a hen will lay depends on the breed of chicken and environmental factors. Pullets will start out slowly, then begin laying about one egg every day or two in the prime of her life (up to about two years old). A hen can lay up to 250 eggs in her first year of laying alone! However, there are some factors that will always affect how many eggs a hen will lay. What Factors Cause Egg Laying to Decrease or Stop? The amount of light during the day will affect a chicken's egg production. The longer daylight hours of summer will yield more eggs than the shorter days of winter. This is natural, and many backyard chicken keepers feel it's important not to interfere with this natural rhythm. Other folks feel it's ok to lengthen the day artificially in winter by using a heat lamp or other light source in the chicken coop for a couple extra hours. Extremes in either direction (hot or cold) are not good for a hen's ability to product eggs. This really is just common sense, right? If I'm too hot, I don't operate at my best, nor do I if I'm too cold. Chickens are the same way! The best temperature for a hen's egg production is between 50 and 85 degrees or so. However, they will live through a wide range of temperatures just fine. I've heard from other backyard chicken owners who live in very cold places, they do just fine through the winter as long as they have an adequate coop. And in hot places, they do need shade, water, and hopefully a breeze to help out. Stress is NOT good for anyone, chickens included. I've noticed that any change in our poultry area, including visits by rambunctious children or overly interested folks, will cause egg production to drop. Even adding new members to the flock can cause a couple of days of decreased egg production. Calm hens are happy hens. And happy hens are hens that lay eggs for you! Molting is the natural loss of a chicken's feathers, and usually takes place in the Fall, right before Winter. Then chicken will lose some or all of her feathers, while new feathers grow out. A hen can look pretty strange during this time, which can last about four weeks---but don't worry. She'll be beautiful again soon. During molting, egg production often decreases because the hen body is using energy for new feathers, which consist mostly of protein. Just be patient with her during this time. If you want more information about molting, check out "Why is My Chicken Going Bald?" 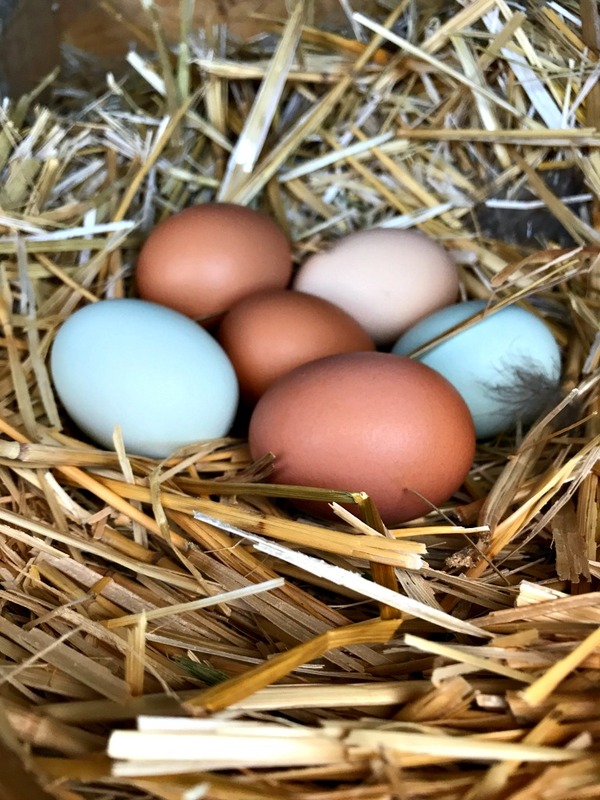 There is just nothing like fresh backyard chicken eggs, with their bright yellow yolks, their vibrant eggshell colors, and knowing you are eating a healthy, natural egg. See the one in the middle? That's an egg from a new "teenage" layer. That's why it's smaller than the others. Chickens (hens) will continue to lay eggs for many years. In fact, we have a hen that was given to us about four years ago, and she was considered an old hen even back then. We estimate her age to be about seven years old! She is a cream-colored Ameraucana, and she still lays an occasional egg for us! Her name is Granny, and we just love her. Hens generally live to be 8-10 years old, but some live much longer if they treated well. As a backyard chicken owner, you have to decide why you are keeping your chickens in the first place? Are they more for pets? Are they for the eggs only? In other words, what is their purpose? Mr. V. and I have two rules on our small homestead: 1) Everyone has to have a purpose of some kind; and 2) Everyone has to be nice. No mean animals or folks around here. So, with our hens, we do cull our flock (reduce the numbers) once or twice a year as needed. And yes, we do "harvest" our birds to eat at this time. However, we have some exceptions. If we have a favorite hen (like Granny), then she is in the safety zone. Hens that are personable and allow us to pick them up easily and love on them stand a better chance of being in this "zone" too. Also, some hens are just better than others at staying healthy, working the horse corral (eating flies over there), and free ranging in positive ways around the homestead (including taking care of ticks). These hens are likely to stay around forever. Not all of our hens get culled--it really just depends on how useful they are once their egg production drops to just a couple times a week. We think of harvesting our birds like this: We treat them exceptionally well for the duration of their life here with us. When they start suffering, get sick, or are no longer useful, then they are dispatched humanely and quickly and provide us or our dogs with needed meat. That may sound harsh, but as Mr. V. is fond of asking folks: "We know our food was loved and treated well. Do you know how your food was treated?" We have a neighbor who didn't want to keep a chicken any longer. But when he suggested dispatching it humanely (as we do) with his wife, she would have none of it. She couldn't bear the thought, you see. They decided to take it down to the nearby creek and let it go, thinking that was a "kinder" way of getting rid of it. Well, I'm sure we all know what happened to that poor bird. It was ripped apart by coyotes, most likely, or picked up by a predator bird---dying a painful, horrible death either way. The lesson here is: Death happens. If you are in control of that, would you want your bird to go happy and quickly? Or scared and horribly? Or....perhaps not at all and live to a good old age? As a chicken owner, that's up to you. You may enjoy reading this article: The Realities of Homesteading (It’s Not All Fun & Glory). When we got our first chickens, we didn't know anything! Over the years of keeping backyard chickens, you get to watch and learn. Sometimes something happens where we'll have to research a special question, but at this point, we've pretty much seen all the normal stuff. And some abnormal stuff too (like, what to do with an egg-bound turkey hen). Anyhow, I hope this article answers your basic questions about a chicken's life cycle from start to finish, in a natural backyard environment, that is. This is just an overall view of a hen's life, and if you have other questions, I'd love if you'd ask in the comments! If you have thoughts you'd like to share with us all, they are also welcome! Uses for Egg Shells: Don't Throw Them Away! P.S. Sign up for our newsletter and get weekly updates, ideas, and recipes not included in the blog! You'll also get access to the growing Resource Library with eBooks, guides, cheat sheets, checklists, and more to help you on your self-reliant journey! Have you ever wanted to make your own traditional hot process soap? Even if you've never made soap before, you'll learn to make perfect soap! Click HERE, or if you prefer Amazon Kindle HERE.